The default provides a wide range of shipping and payment methods which can be restricted to countries, order amount or order status. But every merchant knows it lacks - Shipping and Payment methods need assigning per customer group also! Our Magento 2 extension will help with two simple features. Take the case: You desire to offer free shipping methods for wholesalers to promote their frequent and large purchases. By default, it seems to be solved by setting a minimum order amount. It; however, takes you hours to consider what number of orders to apply: not too low yet also not too high - Such a burden of mind!!! Magento 2 Shipping Method per Customer User makes it super easy. All available shipping options are exhibited at your fingertips. Feel free to restrict one or multiple customer groups to each. Only one minute it might take. 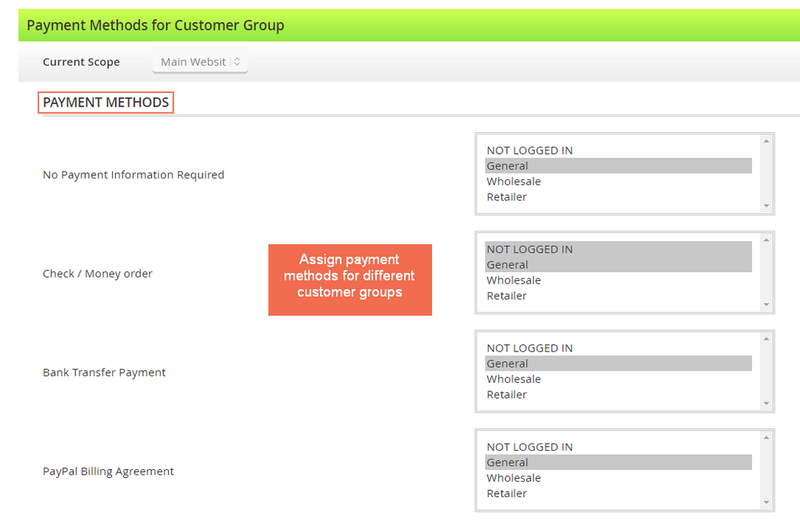 The similar goes for managing the availability of payment options per customer group. Please note that payment settings are essential to ensure your financial flow and security. For example, nowadays individuals love fast and convenient online payment methods - Hence, show all available to them. Whereas wholesalers who have been doing business with you in a long term and often purchase in bulk, it is preferred to allow Purchase Order, Bank Transfer or Check/Money Order. With our extension, it takes only another 1 minute. Why Magento 2 Shipping and Payment Method per Customer Group is Your Best Choice? Checkout is the make-or-break process. Hence, make every piece smooth and convenient, especially when it comes to shipping and payment selections. So, “why in the world you show it in the checkout. What a misunderstanding and annoying!” thought your customers. For sure, they drop the cart and never come back again. Magento 2 Shipping and Payment Method per Customer Group helps avoid such the situation at the first place. Not only about this Magento 2 Shipping & Payment per Customer Group extension, your support even gave me useful advices on otherfeatures and extensions. Thanks again! In the beginning, I thought it's quite complicated, but no, it is pretty easy for store owners like me to use. Good support, reasonable price. At first I had doubts if this extension might work with 3rd party payment methods. But... It does the job very well and detects them. The only thing that could be improved is the design in the backend. I also got trouble with shipping and payment methods in Magento 2 site. It was really annoying and confusing. But now thanks to your Shipping and Payment Method per Customer Group for Magento 2, now it can be managed at ease. It is an ideal extension! 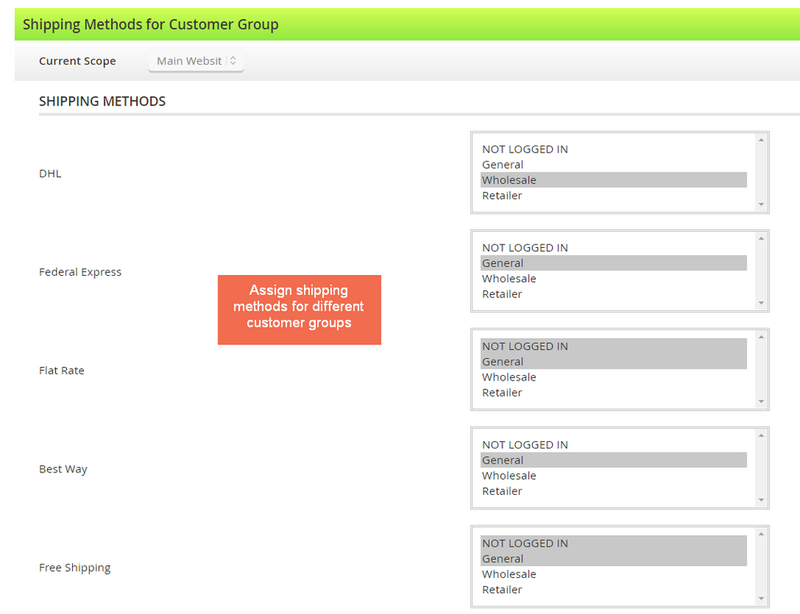 I am no longer confused with shipping and payment method for each customer group by this extension. Thank to your extension and your support team, now I can easily manage which method per group!